Appliances that operate at high temperatures need insulation to make them more efficient or to bring the cold face temperature down to a level that meets code. Lynn Manufacturing can help design insulation packages that meet EnergyStar certification and Department of Energy efficiency codes. 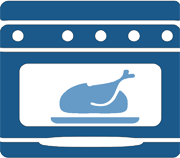 Lynn Manufacturing can manufacture lightweight insulating materials to be used as thermal barriers, gaskets, and heat shields for appliances like; ovens, toasters, grills and dryers. Costs of insulating kits can be reduced by building superwool/mineral wool hybrid insulating panels that meet overall insulating parameters.